“Reform, Perform and Transform” Vice President Venkaiah Naidu motivates students at BIMTECH Convocation 2018! Birla Institute of Management Technology observed its convocation for 2018 today. Vice-President M. Venkaiah Naidu was the chief guest for the occasion. Vice-President of India M. Venkaiah Naidu motivated all students with a thumping speech. He touched upon various topics ranging from Yoga to importance of native language to empowerment through education. Stressing on India’s youth population and its significance in modern era he said, “India’s very young human resource capital is our greatest wealth and the country must be able to effectively harness nation’s demographic dividend. This is rich human potential can turn into a force multiplier only when the youngsters acquire adequate skills and expertise in tune with the requirements of various sectors like industry, agriculture and services”. 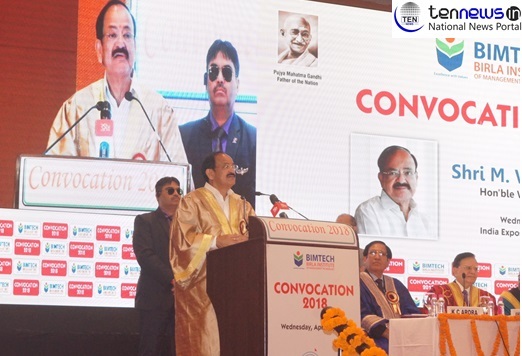 Vice President Venkaiah Naidu asked educational institutions to reorient their syllabi and methods of pedagogy to prepare tomorrow’s students, who will not only be articulate and self-confident, but also well-equipped to face the challenges of the 21st century. He further said that we need to have a stable and expanding educational infrastructure at all levels and the Government of India is very much alive to this pressing need. The need to increase focus on research publications in Management institutions like BIMTECH, he added. Underling the importance of skill development, he said government is implementing various schemes in association with institutions like NASSCOM to implement skill upgradation programmes in association with educational and professional bodies. He further said that skilling in different vocations is very crucial for India to emerge as one of the top countries in the manufacturing and services sectors. The Skill India programme seeks to bridge skills deficit in various areas and the progress of such initiatives is being monitored constantly and course corrections are being made wherever needed, he said. Saying that it is the best time for talented youth to not only look for opportunities but also create their own businesses in India, the Vice President said that management students must aspire to be job creators and not job seekers. He further said that the youth must take advantage of the opportunities created by the government to push for entrepreneur-based employment. Various initiatives like Startup India, Stand Up India and Make in India will help in tapping the entrepreneurial talent in the country, he added. The Vice President said that Education does not end with the acquisition of degrees or completion of college curriculum and the real education must help to build your character, capacity and calibre and ensure that you always conduct yourselves with dignity and equanimity, irrespective of the daunting challenges. Education is not only for employment but for empowerment and enlightenment of an individual, he added. 257 killed as Algerian military plane crashes soon after take-off outside capital Algiers, say reports.